Hey people! 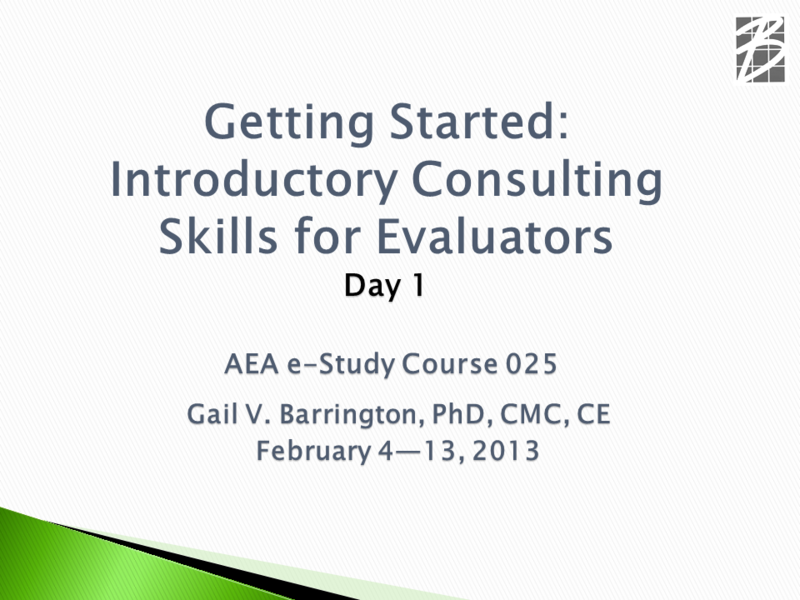 I’m Stephanie Evergreen and lately I’ve been rebooting five slides from five of AEA’s eStudy workshop presenters. In this installment, I actually rebooted six (couldn’t help myself) from Gail Barrington. I’ll talk about two here and you can read about the rest on the Potent Presentations Initiative site. Lessons Learned: Gail’s slidedeck is an excellent companion to her book. She has it structured similarly and, of course, she wants people coming to her webinar to be ultimately driven to go buy her book afterward. So, my goal in this slideshow was to give her slides the same look and feel, for some visual recognition that would help make identification of her book easier. Indeed, Gail had already invested in a redesign of her consulting website to make it look and feel more aligned with her book. Thus the slides needed to have the same colors. 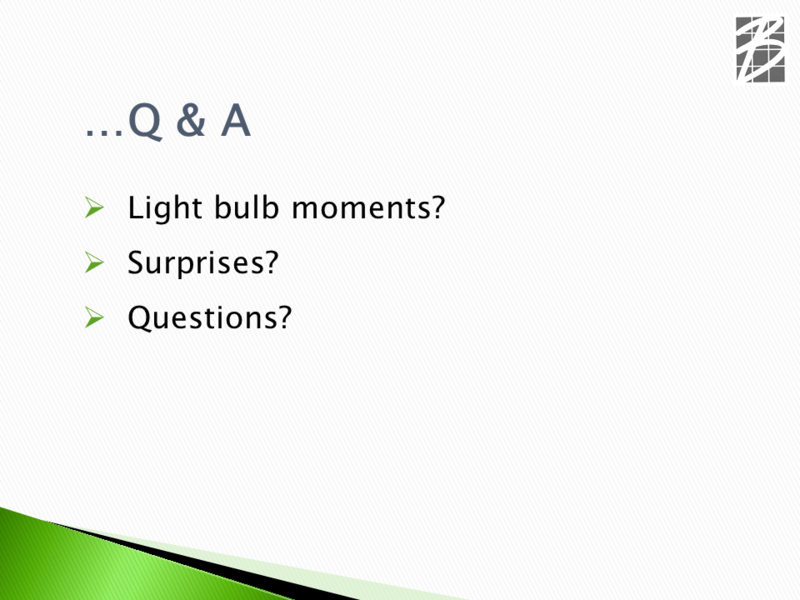 She had been using a bright green color, mainly because it was what was preloaded into the slide template from PowerPoint she was using. The template itself wasn’t awful. So I worked in the slide master, where I could manipulate the colors of the triangles in the corner of her slides. That’s where I was able to change it from green to the same golden yellow on her book and website. 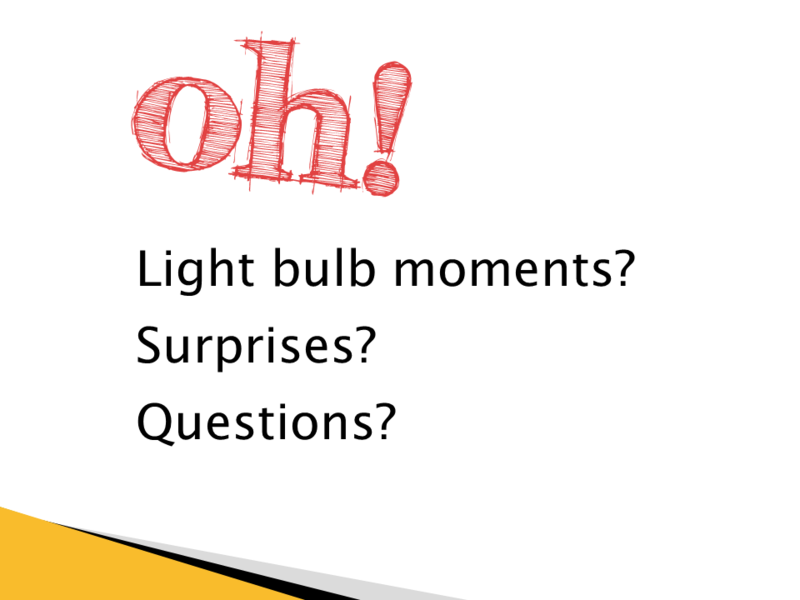 Hot Tips: Gail’s question breaks are designated visually with this slide. Question breaks aren’t necessarily the time to wow people with awesome visuals because we want them thinking and reflecting and coming up with interesting things to ask. Still, some visual inspiration and branding is appropriate. In this particular project (as with many of yours, I’m sure) there was no budget for graphics. I couldn’t go purchase a pretty stock photo of a light bulb. I can, however, make a visual out of the characteristic font I chose. I typed “oh!” into a textbox and rotated it slightly. Even without pictures, we can add graphic enhancement to make a bigger impact. Rad Resources: Gail is giving two workshops at this year’s annual conference – one on Introductory Consulting Skills and another on Intermediate Consulting Skills. Today’s post is second in a five part series sponsored AEA’s Potent Presentations Initiative (p2i). We’ll have one per month. Do you have questions, concerns, kudos, or content to extend this aea365 contribution? Please add them in the comments section for this post on the aea365 webpage so that we may enrich our community of practice. Would you like to submit an aea365 Tip? Please send a note of interest to aea365@eval.org. 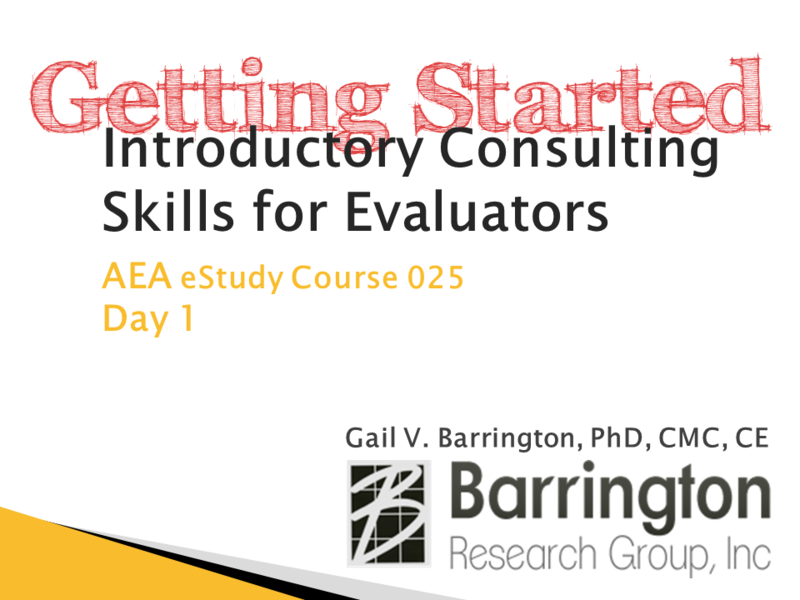 aea365 is sponsored by the American Evaluation Association and provides a Tip-a-Day by and for evaluators. It’s amazing what a change in font can do, isn’t it? As hard as it is for lots of organizations, moving away from Arial can have a big impact. As always, great work Stephanie! The entire look and feel has that professional graphic designer appearance. I especially love the font choice.